You’ve reached the end! 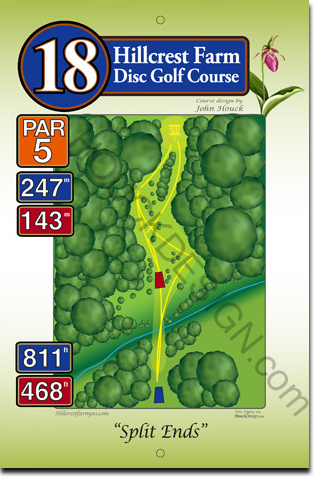 The long tee for hole 18 is on the far side of the brook to the basket, the short tee is on the near side of this par 5, 247 metre final hole. Once you’re across the brook, the fairway leads sharply uphill to split into two branches, the narrow right branch and the wider but longer left branch. Both branches meet before the basket, which is nestled in the trees on a tricky slope.